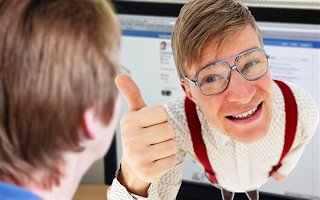 IWASSA Co.: 6 important benefits of Facebook on our lives may not have heard before. 6 important benefits of Facebook on our lives may not have heard before. Spend some time on sites such as Facebook and social networking in general is always seen as a waste of time only, but some research and Western studies based on live experiments denies this claim, and not only that, but you go these studies away and emphasizes that these sites and led by Facebook can to be useful to users in most of the psychological and physical aspects in this post you will learn together on some of the benefits of Facebook that may have surprised them. Some studies suggest that by the Massachusetts Institute of Technology (USA) and the University of Milan (Italy) to spend some time on Facebook can help people to relax, reducing heartbeat. The study examined 30 students in three cases: Show landscapes, solve complex calculations and the use of Facebook. The situation was more relaxed in the first, and it was more stressful in the second case, but the time spent on Facebook showed high levels of gravity and relax. Discovery supports the hypothesis that certainly the success of Facebook and other social networks directly linked to cases of mental and physical positive to its users. Books and movies, only after your study for 5 minutes on Facebook. Facebook allows people to know the mysteries themselves, and what is the best side of them through criticism and praise of others, which improves self-esteem. JEFF HANCOCK researcher from Cornell University (United Kingdom), indicates that this is not a matter of self-deception: the image that is displayed is the positive version of yourself, not a travesty. This was the first study of its kind, which refers to the psychological benefits of the use of Facebook. Facebook is not only beneficial for mental and physical health is also a good investment: There is a relationship between the popularity of the brand and what is being published comments and share experiences about brands and the economic performance of the brand. This discovery opens up a new market for small businesses in the social media as well so people can benefit economically from Facebook can use this platform to make some money. Many people believe that social networking distract employees from their work, but the survey shows that the site keas.com time for 10 minutes on Facebook break makes employees happier, healthier and more productive. The study compared three groups of employees, who were not allowed to take this interval, and the second group was allowed to periods where they can do anything, but without the use of the Internet, while the third group was allowed to the Internet and Facebook use for 10 minutes. The Facebook group more productive by 16% of the group who could not use the Internet and nearly 40% more productive than the group that did not allow her to take comfort. Facebook helps you in your studies! Facebook seems to help students in their studies, and this is what showed in search of Abilene Christian University (USA), where among the students who were most active on Facebook were more likely to return in the second year. He also said the search also that students who were more active on Facebook showed more enthusiasm to join the study atmosphere.